Yes folks, the sun seems to be creeping out of its hiding place and making a more substantial appearance, and what better way to enjoy this beautiful weather than with a garden party or BBQ? Get the paper cups out, the plastic table cloth, stock up on those saucy little condiments and fire up that BBQ. 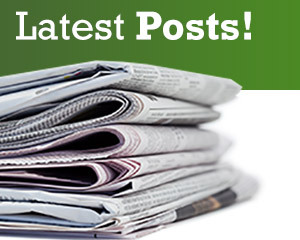 Much like home décor and fashion, landscaping and gardening follows certain trends, year in and year out. Different styles fall in and out of favour as people find new ways to build themselves a beautiful garden. 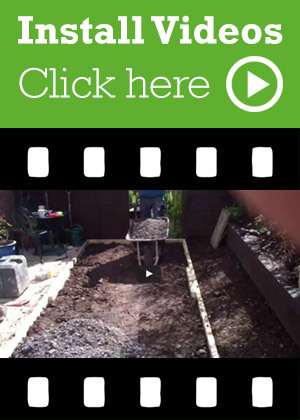 This year there are three main trends that have been at the forefront of landscape and garden design. 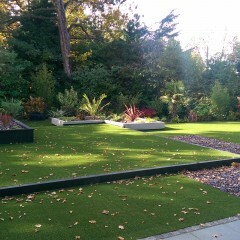 Woburn is pretty much a celebrity now in the world of artificial grass! 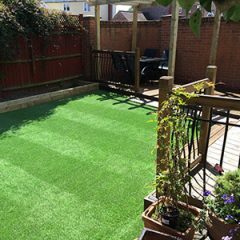 It’s in such high demand and everyone who works with it says it’s the most realistic and natural looking grass they’ve ever seen! 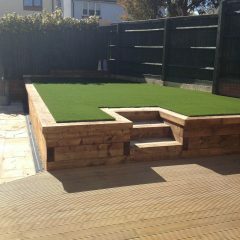 It is so adaptable and looks fantastic in every kind of garden design we’ve seen it used in so far. Take these two very different gardens for example. 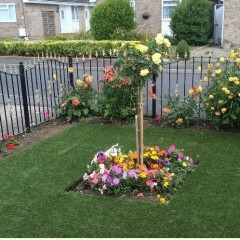 The top picture is of a gorgeous little front garden, complete with flowers and an air of vintage charm, the bottom picture being a contemporary back yard with clean crisp lines and a modern, minimal feel. If you’re like us, you’ll absolutely love makeover shows such as Changing Rooms, Ground Force, 60 Minute Makeover and DIY SOS. Seeing a dank kitchen, a bad bedroom, a pretty sad garden or some dodgy DIY, get rectified and transformed within the space of an hour, to the delight of the despairing homeowners is just so satisfying. Don’t you think? We’re in the April edition of Landscape Preview magazine! 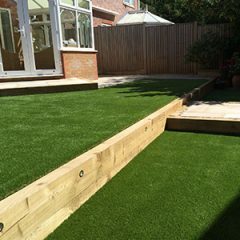 We chose to highlight the install carried out by JS Garden projects, who created a stunning and visually interesting garden for a family in Bowdon last year. The design brief was an interesting one; construct a modern design using angular shapes, fusing differing levels with architectural style planting. 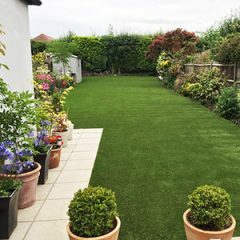 Our gorgeous soft touch Woburn was used which was a welcome addition to the design because the family had two children as well as a dog, so not only was the grass perfect for the children to play on safely, it was great for the dog too as it’s hardwearing despite feeling so soft and lush. Artificial Grass Notting Hill is known for many things. There’s the award-winning, 1999 romantic comedy of the same name, starring Julia Roberts and Hugh Grant, which is set in the area. There’s the Notting Hill Carnival that is an annual event that has taken place every year since 1966. The event is one of the largest street festivals in the world with around one million people attending. It is led by members of the British West Indian community and is a staple of British culture. There’s also the Portobello Road Market, one of London’s notable street markets, known for its second-hand clothes and antiques, as well as it’s array of fresh fruit and veg which draws a plethora of tourists to the area. Notting Hill also boasts a host of trendy restaurants, bars and shops. 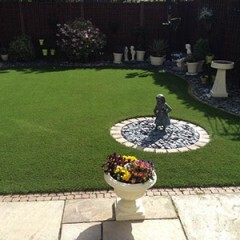 Last year we sent a roll of our Tewkesbury to a family who had ordered the grass for a self-install. They had a gorgeous dog too as well as children however the garden they had was a nightmare. It was slimy and terribly patchy, and completely unable to be played on or used at all. The customer self-installed therefore we didn’t need to send a landscaper out or do any referrals. 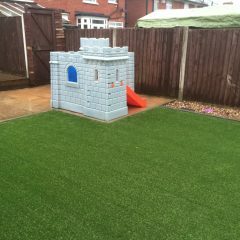 The end result was fantastic as you can see from these photos! 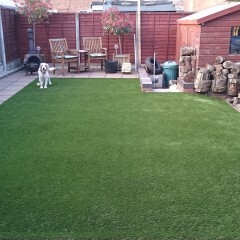 The doggy loved it and they were so pleased with how their hard graft paid off. Here at QuickGrass we love to hear feedback from our customers, and when we received an email from a customer recently it was no exception! 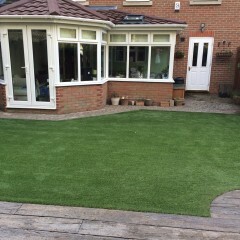 The lady had our bestselling soft touch Woburn installed by London Lawns, and she is absolutely thrilled with the results.